I can’t believe it’s been 10 years since Orange Springs Retreat Center was featured in the New York Times! We have come such a long way with updated facilities, cabins and activities but we still have the same spirit! When you arrive at the Orange Springs Retreat Center, a feeling of “home” and comfort suddenly takes over. You can feel the peace, quiet and beautiful energy! As you drive up the “dirt road” you suddenly shift into excitement and wonder as you see the famous lake and the massive “iceberg” and trampoline! 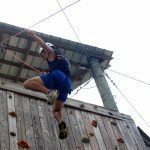 If you wanter further back, you notice the giant rock wall and ropes course and instantly, you are certain you have signed up for a great time! Ten years can feel like a lifetime before you begin, but looking back, it seems to have flown by. Your peaceful spirit and need for excitement are what brought you here, the great time is what keeps you coming back. Have you attended a retreat at Orange Springs Retreat Center or know someone looking to book an event? Contact us here. Please visit our Facebook Page for pictures and reviews! In 1971 The Sokol family began a summer camp by founders Dave and Shelly. In 2002 their son Mike Sokol created the year round retreat business known as Orange Springs Retreat Center, going strong to this day. Stay up to date with everything happening at Orange Springs Retreat Center. Our email newsletter contains information about our facilities, plus much more. @ 1971-2017 Ocean Springs Retreat Center. All rights reserved.